Transportation issues impact everyone in Canton and around the region. The CCA Transportation Committee reviews details on behalf of the board and provides feedback. Recent meetings have focused on a five-pronged action plan that the committee hopes to make actionable changes on in the near-term. The plan includes, in order of priority, Complete Streets legislation, the Boston Street Multimodal Study, BaltimoreLink, O'Donnell Square Park pedestrian access, and the beleaguered Baltimore Bike-share program. 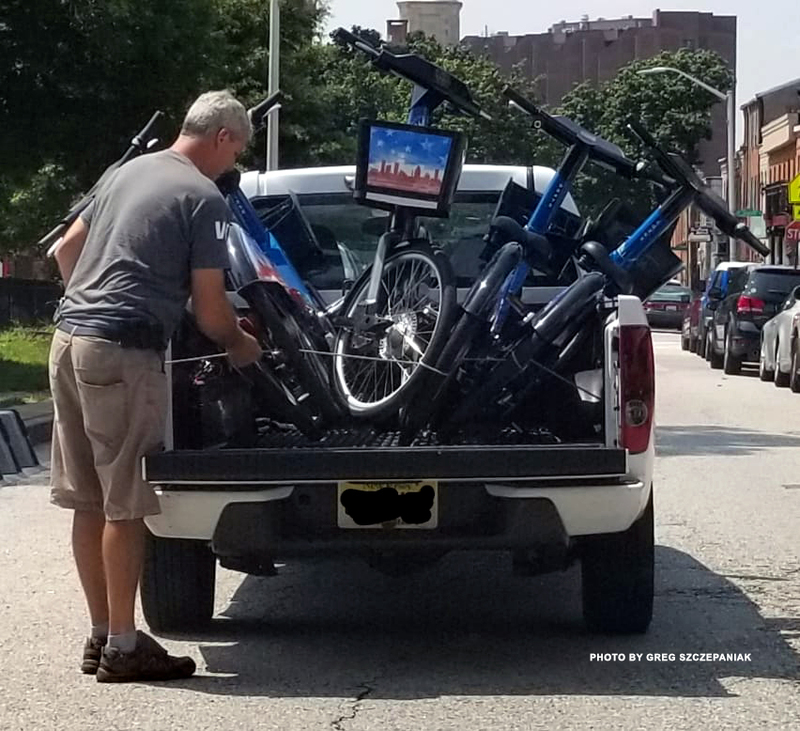 Baltimore City canceled its bike-share program on August 15, 2018, after continued problems with vandalism and theft, coupled with the operating vendor's inability to keep up with the maintenance needs of the program. In June, data showed that fewer than 100 of the 500 were on the streets, on average. The failure of the program has "nothing to do with the Potomac Street bike lane," said Chris Brown, committee deputy. Brown explained further that the city had not made any announcements on the fate of the two docks in the neighborhood at O'Donnell Square and the Can Company. In an effort to provide other eco-friendly, non-automobile modes of transportation, the city is offering a permit option for private dockless bike-share and electric scooter vendors to come to Baltimore in place of a city-run option. Scooter company Bird has already landed in Canton, and the Lime scooters are rolling out, with rental prices around $1 and then 15¢ a minute. The transportation committee will follow this transition closely. Neighbors have raised various concerns about the safety and effectiveness of the intersection at Boston and Aliceanna Streets, specifically in regard to vehicles making illegal left turns onto Van Lill Street. CCA president and former transportation committee chair Mark Edelson organized a meeting with Baltimore City Department of Transportation (DOT) staff and other community leaders to take a look at the issue first hand. At the meeting, Edelson applauded DOT for working on some short-term improvements like repainting the lines and reorganizing the signs. He went on to say that the community should be, "Putting our minds together to solve the problem with a more long-term solution looking at the direction of the lanes, looking into a curb bump out, and changing the signal priority as well as enforcement of illegal turns." Another matter concerning the intersection at Boston and Aliceanna is the 10-minute parking zone adjacent to Captain James that conflicts with the peak-hour parking restriction on Boston Street and causes massive traffic delays during rush hour. In particular, Baltimore Link buses that travel Boston Street are slowed from traversing this bottleneck. Through working with 311, Baltimore City DOT, and the community, the committee was able to convince the city to prohibit 10-minute parking next to Captain James between 4:00 p.m. and 7:00 p.m.
Boston Street is the transportation backbone of the community—and it also divides us. The 2-4 lanes of heavy traffic are loud and do not offer many options to cross safely to enjoy our waterfront promenade. The city released a study last year that sought to widen further and increase speeds and the number of cars on Boston Street. The committee reviewed a draft of the corridor study and found the recommendations, "are not in the best interests of the Canton neighborhood and southeast Baltimore as a whole." Please consider attending the open meetings of the CCA Transportation Committee to learn more about the everyday transportation matters that impact the Canton area. The committee meets on the third Wednesday of every month from 6:30-7:30 p.m. at the Broom Factory at 3500 Boston Street. Join us if you're interested in how transportation intersects with our community way of life. For more info, email elliott.plack@gmail.com.